This species is widespread with some evidence of diminishing suitable habitat but still can be found to be locally numerous under favorable conditions. 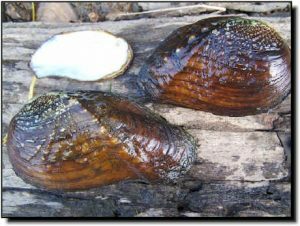 It is found in the Mississippi river drainage and Gulf drainage streams from the Alabama river system west to central Texas; from western Pennsylvania, west to southern Minnesota, south and west to Oklahoma and Texas; the Cumberland, Tennessee, and Alabama River systems. 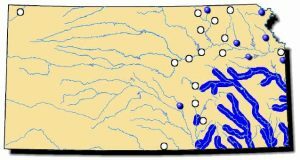 Recently a live specimen was found in the Big Blue River at Beatrice, Nebraska; a state previously thought to have only historical or sub-fossil specimens. Comments: With the general shape of a pistolgrip, this mussel is easily identified. The sexes differ in shape as the female is more elongated than the male. Recent research has also shown pistolgrips will move toward each other as spawning season approaches. This may help ensure the eggs within the female’s gill pouches are fertilized because the male simply releases sperm into the open water. Its fish hosts are all in the catfish family and some authorities believe it uses scent to attract these host fish to enhance its chances of completing its life cycle. The pistolgrip is found in rivers and streams with permanent flow and occasionally in reservoirs.